Developed & narrated by Peggy Phoenix Dubro, this DVD contains valuable information and experience for everyone in the process of personal growth and evolution. 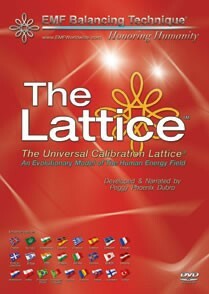 View 3-dimensional animations of the Universal Calibration Lattice (UCL), a system within the human energy anatomy composed of fibers of light and energy. Learn to do the EMF Introductory Energy Session. This DVD contains valuable information and experience for everyone in the process of personal growth and evolution. Peggy Phoenix Dubro - Working with the Lattice! Peggy Phoenix Dubro is the originator of the EMF Balancing Technique®. Along with her husband Stephen, she is co-founder of the Energy Extension, Inc., an international organization with representatives in more than 70 countries. Since her discovery of the UCL in 1988, Peggy has methodically developed a unique understanding of this system in the human energy anatomy, making her the world's foremost authority regarding this information.